Lubricity Labs founder Boyce Clark and his now smooth-haired daughter Alden in the company's laboratory. Photos by Collin Richie. 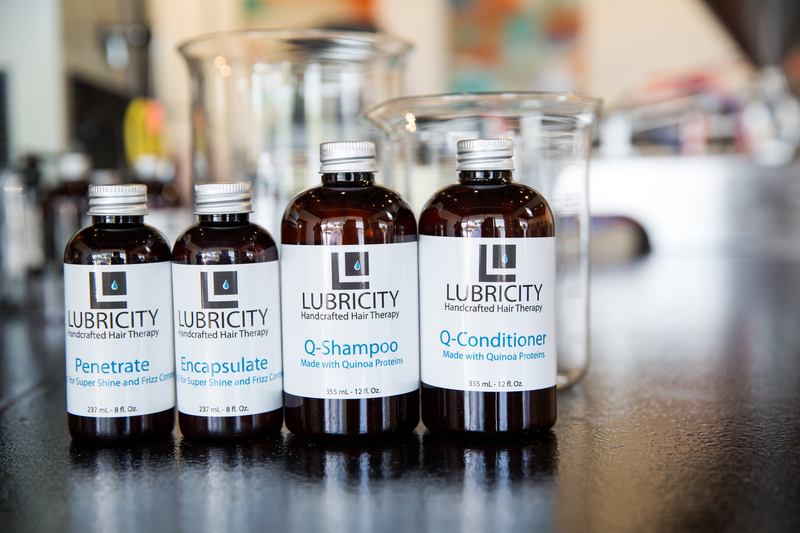 The Lubricity Labs line includes a system of products designed to be used in tandem. When Boyce Clark founded Lubricity Labs and his line of specialty hair products, he didn’t quite know that he was founding Lubricity Labs and a line of specialty hair products. Back in 2014, Clark—who has several credentials under his belt, including an undergraduate degree from Millsaps College, a Ph.D. from LSU, and a stint as a fellow at Oak Ridge National Laboratory in Tennessee—still worked as an energy consultant who spent weeks at a time overseeing research in the Arctic Circle. The game-changer? His daughter Alden, who, then at age 12, struggled every morning to control and style her thick, unruly hair. Utilizing his science background for his daughter’s advantage—and wary of existing solutions that depended on harsh chemicals—Clark used his access to exclusive pharmacological ingredients to craft what he hoped would be the product to end the woes of Alden’s morning routine. In short, his plan worked. These days, Clark has quit his job as an energy consultant to work full time on Lubricity Labs, the name he extended to his range of smoothing hair care creeping across the national market. But how does someone find such success on such a whim? To dive deeper into Clark’s amazing story, we’ve laid out a timeline of Lubricity’s history, from day one mixing samples in the kitchen, to the day just a few weeks ago that Lubricity Labs “broke the Internet” after mile-high sales upended Clark’s game plan for good. Mid 2015 – Finally, on his 17th experimental batch, Clark discovers a formula fierce enough to combat Louisiana’s frizz-inducing humidity, with results so noticeable that inquiring parents at Alden’s school began asking for samples. Clark distributed these in Tupperware containers. Fall 2015 – Local spa Bumble Lane contacts Clark and asks to sell his products in store. Clark accepts the offer, and other local business begin to reach out. He soon sets up a website to represent the concoction he used to stir inside Home Depot buckets in his kitchen. March 2016 – Clark quits his job as a consultant to work full time for Lubricity Labs, whose products he still bottles by hand. September 2016 – inRegister writes a story about Clark and Lubricity Labs, attracting more attention to the brand. November 2016 – Clark wins a $200,000 grant and lab space at LSU’s Innovation Park at the Pitch Night competition during Baton Rouge Entrepreneurship Week. December 21, 2016 – The Baton Rouge Business Report writes an article about Clark and his Entrepreneurship Week win. February 17, 2017 – A story, “Fighting Frizz,” by reporter Lauren Westbrook, airs on WAFB. This is the first of many national media outlets who will cover Lubricity Labs within the same month. February 18, 2017 – The WAFB news story is picked up by a CBS affiliate in California, causing the Lubricity website to receive so much web traffic that it crashes. It will crash again the next day. Eventually, upward of 18 national news affiliates will report stories on the brand. February 21, 2017 – The editor of Yahoo! Beauty calls and publishes a story of her own after seeing one of the newscasts aired around the country. The story, says Lubricity chief operating officer Robin Keller, remained the top story on the Yahoo! Beauty homepage for three consecutive days. February 22, 2017 – The website crashes again, “breaking the Internet” with so many orders that Clark can barely keep up. At maximum capacity, Clark’s lab handles about 1,600 bottles a day. According to Keller, though, that just isn’t fast enough anymore, and the team is working to accelerate their process to fill more orders in better time. As Lubricity continues to grow, however, Keller says it remains, at its heart, a product in debt to the Baton Rouge community and the businesses that supported them–and continue to support them–on the way up. To learn more about Clark and the Lubricity products, visit lubricitylabs.com.